I'm mostly interested in annotating a PDF file with text at a predetermined position. GUIs and command line utilities are both Ok, but only free software solutions, please. However, I included image additions for completeness. To be clear, the annotations must be part of the PDF file, otherwise it is not useful. There are two similar questions on Ask Ubuntu, but they are both a couple of years old. 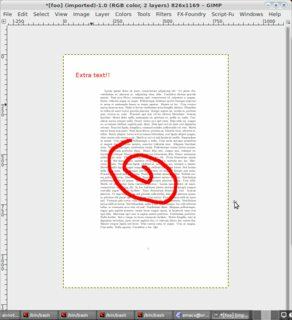 These are How can I add text and images (for example, a signature) to a PDF? and How can I edit a picture into an existing PDF file? I've tried Xournal, which does work. However, I think a little tutorial about how to do this would be good, so you want to add a small tutorial on how to use Xournal to accomplish these tasks, please add an answer. I also tried updf, which didn't work for me, though this answer and this one for example says it can. I rebuilt the package (which is pure Python) on Debian Wheezy, using the sources from the updf PPA. It seems quite primitive and the "Save As" dialog did not even have a save button. If other people have had different experiences, please post. For each answer, please provide a brief tutorial with screenshots if appropriate, as to how you accomplished this task. 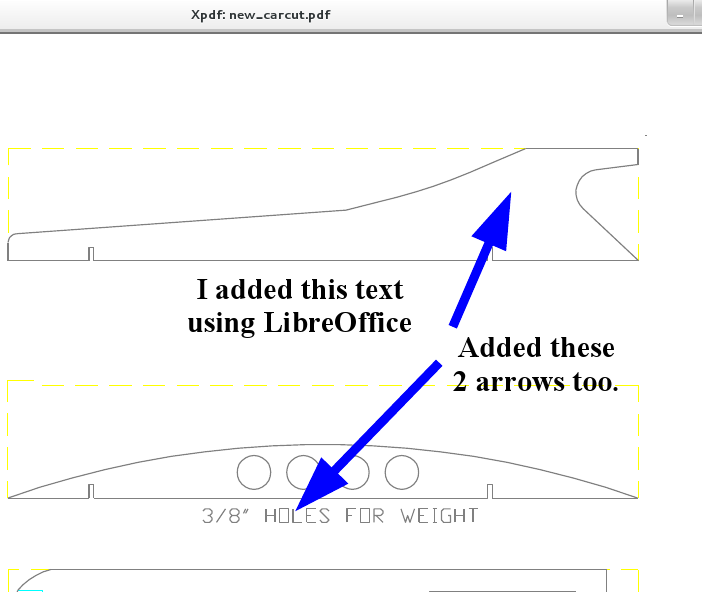 Once in LibreOffice Draw I simply annotated the PDF as if it were a normal document/image. 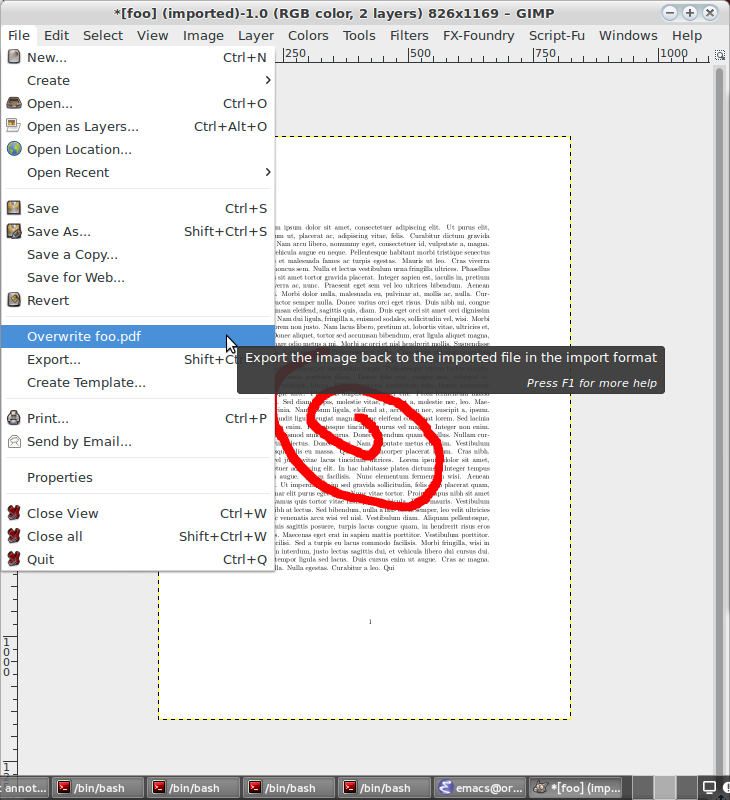 Once done I clicked the PDF icon in Draw's toolbar to export the file out as a new PDF file. This was the result of my effort. But LibreOffice doesn't work for me? This is what the package looks like on Red Hat based distros such as Fedora. I would assume that on Debian/Ubuntu there is a similarly named package, probably libreoffice-pdfimport. Okular allows you to review and annotate your documents. 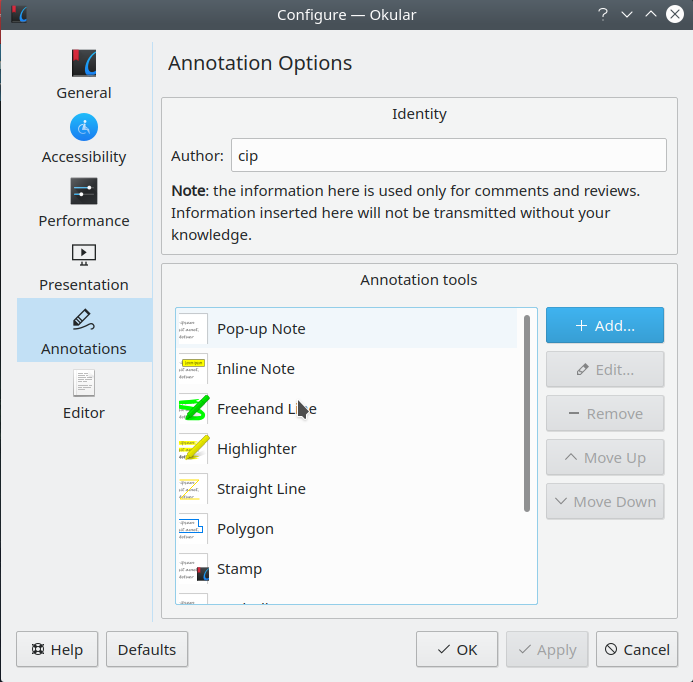 Annotations created in Okular are automatically saved in the internal local data folder for each user. Okular does not implicitly change any document it opens. As @Terdon's answer shows, you can also use GIMP, along with a whole host of other tools. @Terdon also was kind enough to post this link in our chatroom which has a list of other tools for annotating PDFs as well as viewing them. Since you just want to overlay text at a predetermined position, you can use pdftk to do this. You need two PDF files. One is the PDF file that you want to stamp with the text. The other PDF file is the text you want to stamp. The second one must have a transparent background. 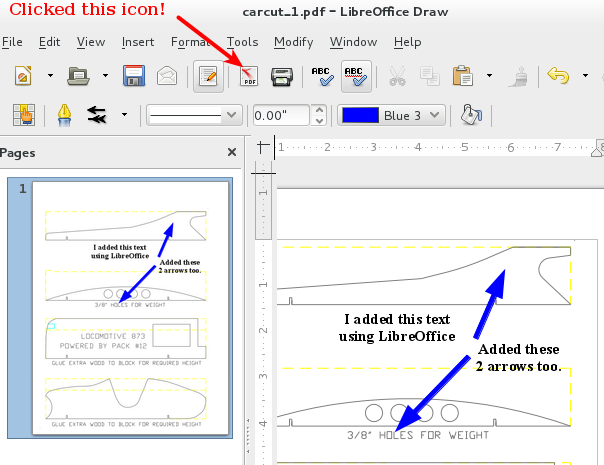 You can easily make this with, say, LibreOffice Draw, and print to pdf using cups-pdf. Exporting to PDF—even if you don't select PDF1/A—will make an opaque background. 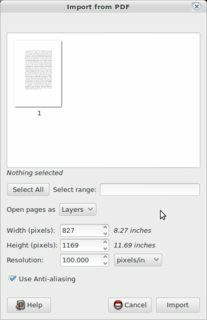 CUPS-PDF is a print driver for CUPS that creates PDF files from print jobs. To use it, you must be using CUPS. Install the cups-pdf package (required at least in Debian). Visit the CUPS administrative interface at http://localhost:631/admin and click 'Add Printer'. You should see "CUPS-PDF (Virtual PDF Printer)" as an option. Select it, press continue. Fill in the queue names, etc and continue again. If asked for a PPD, it's under generic. Once you've added that printer, it can be fully configured in /etc/cups/cups-pdf.conf. To use it, print like normal, but select it as the printer, instead of your normal printer. The PDF file will be plopped into $HOME/PDF by default. For details, see the Annotation reference page from the Okular manual. Since Okular 0.15 you can also save annotations directly into PDF files. This feature is only available if Okular has been built with version 0.20 or later of Poppler rendering library. First, you need to annotate the PDF. You can do this via the menu or via a keystroke. You can find the tools under Tools->Review, or via the keystroke F6. This will bring up a menu on the left, with a variety of options. Probably the best option for inline annotations is "Inline Note". Follow instructions in the link to save the note. As noted in the link, the background color, font and other features of the note can be customized. See also Change and save pdf annotation setting in Okular?. To save the annotation to the PDF file, as is desirable, you need to save the annotations back to the file using Save As. The annotation is seen by xpdf and evince (which throws the warning " WARNING **: Unimplemented annotation: POPPLER_ANNOT_FREE_TEXT. It is a known issue and it might be implemented in the future." but still shows the annotation), but not by acroread (9.5.5) or the PDF plugin of Chromium (45.0.2454.85). It also prints Ok using gtklp, a CUPS frontend. 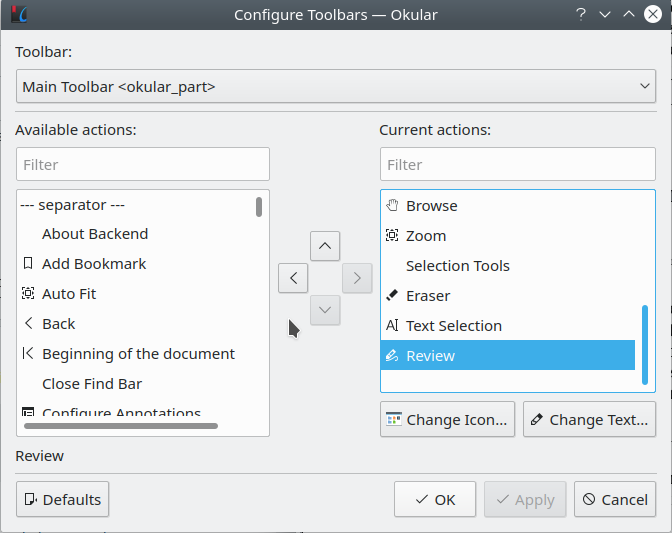 The Review feature can be added to the toolbar: Settings - Configure toolbars - change under Toolbar: Main Toolbar okular_part - filter available actions by searching "Review", and add it to the current actions to the right. 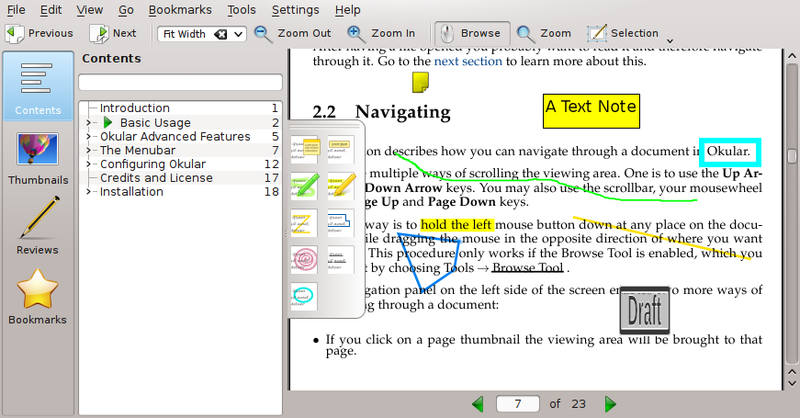 The annotations options can be edited, new variants can be added: right click on the Review buttons and select "Configure Annotations"
A good choice for annotation is TeX, specifically LaTeX in conjunction with the LaTeX package pdfpages, and the drawing package TikZ. An example script follows. 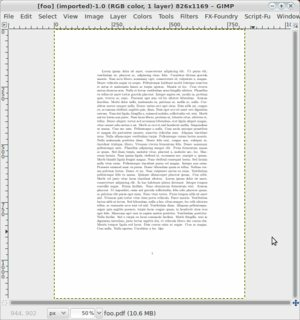 This is the overlay of the two page document text.pdf. The command \includepdf from the pdfpages package is invoked with the pagecommand option to include the first page of the pdf, along with some overlaid text using TikZ. Then the second page is included using \includepdf, but without any annotations. This is an extremely powerful, yet simple method, because it uses the full power of TeX and TikZ. making sure that example.tex and text.pdf are at the same directory level. If you want to generate a 2 page pdf for testing, a simple way of doing is to invoke groff. .bp stands for break page, and creates a two page blank PDF. 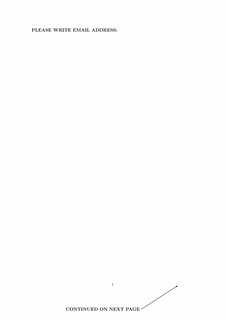 This command is courtesy of James Lowden. It's useful to lay a coordinate grid over the page when doing this, so positioning becomes easier. See, for example, the recipes given in the answers to Grid with coordinates on all sides? and the original answer by Loop Space linked in the question. Not the answer you're looking for? Browse other questions tagged pdf free-software or ask your own question. How do I create a blank PDF from the command line? Unix way to extract vectorised image and its graph from a PDF file?